There are several plants carry the common name of "ice plant," but this species, Delosperma cooperi ,is a warm-weather perennial with intense red-purple flowers that is often used as a spreading ground cover in sunny areas, where it flowers virtually all summer long with intense daisy-like red-purple flowers. A sizeable range of closely related Delosperma species is also available, offering flowers in colors including yellow, orange, scarlet, pink, magenta, and bi-colors. The name "ice plant" derives from tiny hairs on the plant that reflect light in a manner that resembles ice crystals. The foliage is fleshy and succulent-like, and morphs into a darker color as fall temperatures drop. In the southern part of its range it may be evergreen. Individual plants often spread as much as 24 inches, although some instances of 3 or even 4 feet across are reported. It is used most often in sunny but sheltered desert gardens, rock gardens, or slopes or as a ground cover or edging plant. This plant can be invasive in some areas, so caution should be used when planting it. Soil Type: Dry, well-drained soil. Place these plants in a sunny location with fast-draining soil—sandy or gravelly soils are best. Ice plants are best planted by mid-summer in cooler climates, but in hot climates fall planting is preferred. Space plants 15 to 18 inches apart; they will quickly spread to fill empty space. A small amount of compost or time-release fertilizer in each plant hole is a good idea; beyond this, a single does of organic fertilizer in the fall is all that's needed. Water the plants every two weeks during the heat of summer, and avoid more frequent watering. Let them dry out in the fall before winter. Each spring, prune out any winter-killed stems. 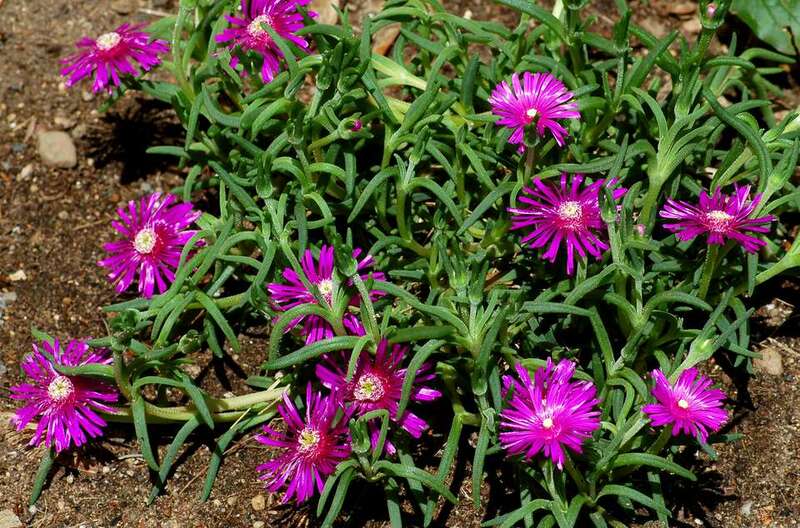 Ice plants prefers full sun in order to flower profusely. Ice plant prefers very well-drained, dry soil. It suffers under conditions that are constantly moist, and doesn't grow at all in dense clay soils. Sandy and gravelly soils are fine for this plant. Water this plant sparingly, if at all, during its growing season—once every two weeks is sufficient during periods when there is no rainfall at all. Let the plants dry out before winter, and if a snow cover is likely, mulch the plants with a dry mulch such as straw to keep them dry for the winter. Although it is sometimes known as hardy iceplant, this species is quite sensitive to cold temperatures, and north of zone 7, its hardiness is not at all assured. It is sometimes planted as an annual it these zones. This is a plant that prefers warm temperatures. Shelter and winter mulching is required in any climate that gets regular snow if you want to grow it as a perennial. Add compost or slow-release fertilizer when planting, then a light dose of more compost or fertilizer in the fall. The plants also do well with no feeding whatsoever. Too much feeding will compromise the plant's ability to survive winter. Ice plant spreads so readily that is is rarely propagated deliberately, but where this is desired, the plants can be reproduced very easily simply by taking stem cuttings and rooting them in water or even simply by embedding the ends of the cuttings in soil. Delosperma 'Alan's Apricot' is a hybrid plant that blooms with large pink flowers that gradually fade to apricot. Delosperma dyeri Red Mountain® Flame begins blooming with bright scarlet-orange flowers in mid-spring for about 4 weeks. Delosperma ashtonii 'Blut' has dark magenta flowers that blooms from late spring into early fall. Delosperma Fire Spinner® is another hybrid, this one featuring flowers that combine orange and purple. It blooms in late spring. Delosperma brunnthaleri (hardy yellow ice plant) has attractive yellow flowers. Delosperma floribundum (starburst ice plant) has pink flowers with a white center. Delosperma herbeau (hardy white ice plant) is a white-flowered type that offers unusual beauty. In early spring, remove any stems that have succumbed to winter kill. Aphids and mealy bugs may be an occasional problem with ice plant; treat them by spraying with water to remove the pests. Severely invested plants may need to be removed.